The International Hydrology Series is a collaborative publishing program between UNESCO, Paris and Cambridge University Press. 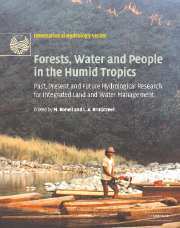 It contains monographs describing research activities in hydrology and the study of hydrological hazards which have been sponsored by the UNESCO International Hydrology Program. The program addresses theoretical issues in the conduct of hydrological research, as well as practical, applied, and water management issues raised by hydrological projects worldwide.